Episode 485: Auto-addition to "Catalogue Mailing List"
"I can hardly get rid of mistakes in Catalogue mailing..."
Our company name is not like this. There is no employee in the name of this. In the worst case, it might be a "Personal information leakage incidents". if the address was not inappropriate such as erroneously submitted in the middle of the input? if the address was not nonsense for mischief purpose? if it does not contain abbreviations or unnecessary space? After the check, "Cover sheets PDF" will be generated automatically, then "a personnel in charge of Mailing" will print it out and enclose the Cover sheet with the Catalogue. No manpower be involved, there. > Update the "Client Master" in kintone by sending JSON data to kintone API. More specifically, it is a mechanism that suppliers (customer code and customer name) is added to the "customer master" on the kintone, upon the moment when a start of trading in the "Credit Management Workflow" has been approved. POSTed to kintone API at the downstream of the Workflow. And in day-to-day business, there are many occasions that you want to refer to data which is classified in A), master type data. 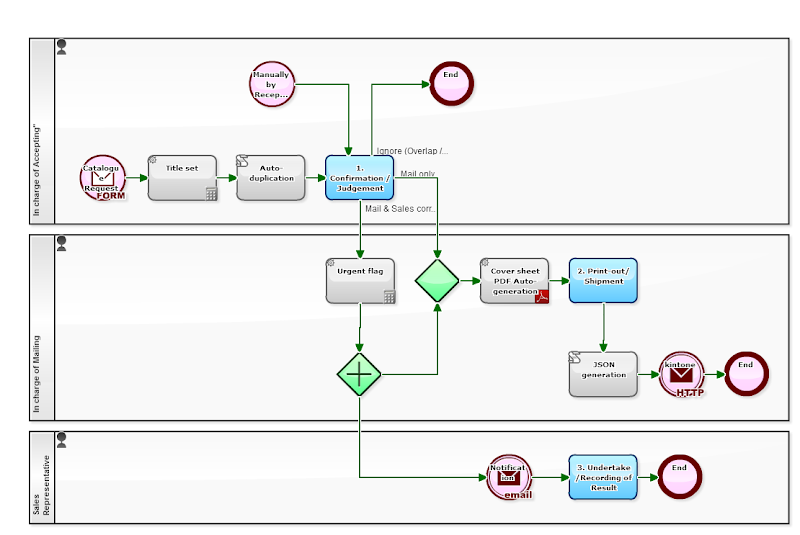 The following Business Process is a mechanism to synchronize "Client Master data" in the Workflow environment with client master information which is managed in "kintone", a Cloud Database, on a daily basis. (It may be considered as a Batch processing.) It is excellent for not only all the Steps having been automated, but also being capable of manually synchronization at any time. 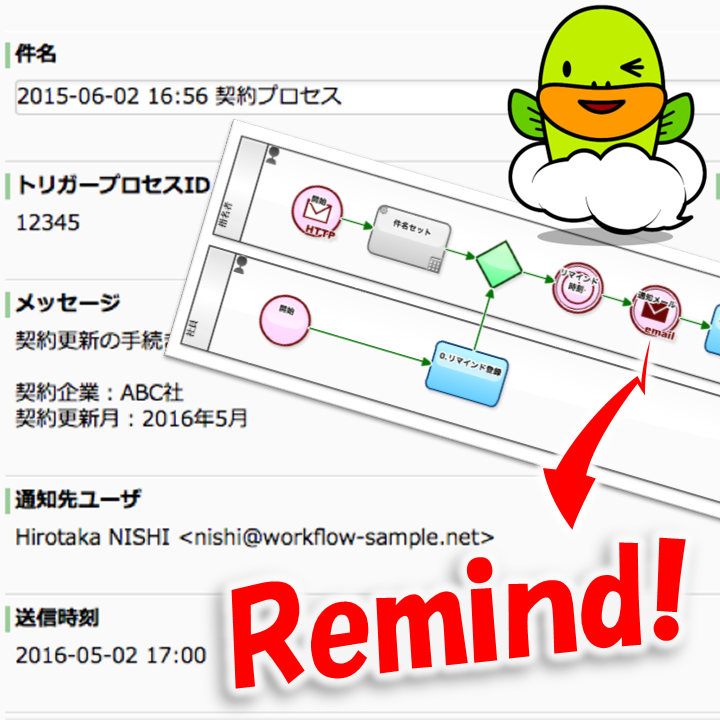 Episode 482: Making A Notification at Later Date Independent as "Reminder Mechanism"? "Reminder notification of Maintenance service contract renewal on the same date in 12 months later." 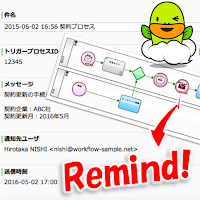 When I design, for example, a Contract Process, I would want an Email alert (Email reminder). That is, I want to arrange an Event to transmit an email at the most downstream of the business flow. That is referred to as [Throwing Message Event (Email)] in the terminology of "Process Modeling" (BPMN terminology). However, the Process will take one year for all the Steps to be completed, if you have setup naturally. Although this may depend on personal preference, I feel uncomfortable that the status of the Issue remains in "Running" just for not yet sending the "Reminder email". If the "Time until all the Steps to be completed" is measured as KPI in your organization, it will truly be an "annoying presence". 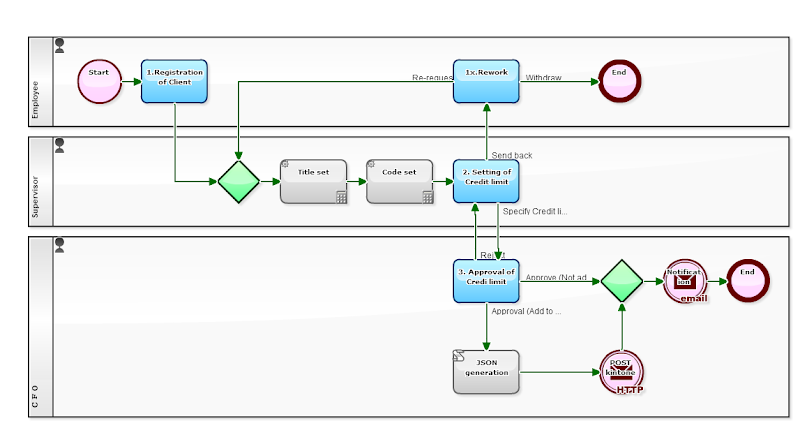 The following Workflow is a Business Process of Email reminder part that is independent. (It is too simple to refer to as a Business Process, though.) In short, it is a mechanism that just to accept "messages" from various Business Processes, and to transmit them at "Reminding date and time". "I wish I could do my input more smoothly..."
A business system is evaluated more or less by its "Operating screen". Just try to recall your day-to-day jobs, such as "Attendance report", "Decision-making request", "Contract report", "Answer to inquiry", so on... Most of the Delays and reworks that occur on these jobs are caused by "erroneous input or Inappropriate input at upstream Steps". The following Workflow has been devised to input by clicking on the "Input sample button". By a button being there, the concentration of inputting personnel will be sustained. Furthermore, occurrence of careless mistakes will be reduced. Even though you won't understand the advantage of "Input sample button" unless you experience, it is another input support that is different from a method of Selecting from options or Configuration of initial value. Even though it is just a button, it helps to go piled up a "sense of doing" of operators because it is their own input!?? And (something like) "CPU load" that give to the brain of the operator will drop significantly.